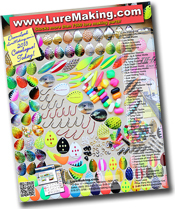 LureMaking.com has the hooks you need to make those really big lures. Whether you are making crankbaits, in-lines, or spinnerbaits we have the hook you need. 934 3x Bronze Needle Point, Round Bend Wide Gap, Straight Point NEW!